Aiden Cawte scored a hat-trick as Oakwood came back from losing 4-0 at half-time to heroically beat Midhurst & Easebourne 6-5. A 96th minute goal by Clive Piller sealed the dramatic victory with his second goal of the game. Shane Saunders completed the list of Oaks scorers as they mounted an unlikely second half fight-back. 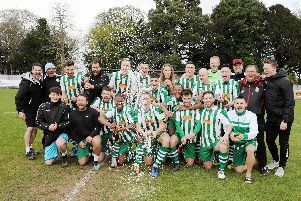 Manager Mark Gilbert said: “Aiden scored goals early in the second half, his third from the penalty spot after he was brought down and you could sense Midhurst were in disarray, and we capitalised on it. Then at 4-4 Midhurst regained the lead before substitutes Gerald Manville and Graham Hawkins helped set-up Piller to score the fifth and sixth goals.